The wedding season started just a few months ago and even days are truly active here we did not want to miss the opportunity to share with you this lively, colourful and unique wedding at Villa Padierna Palace Hotel. When L&R contacted us, they knew exactly what they wanted, what made it more challenging and attractive for us. We just did want to participate in this special occasion! The ceremony was held in the classical Roman amphitheatre from Villa Padierna Palace Hotel. 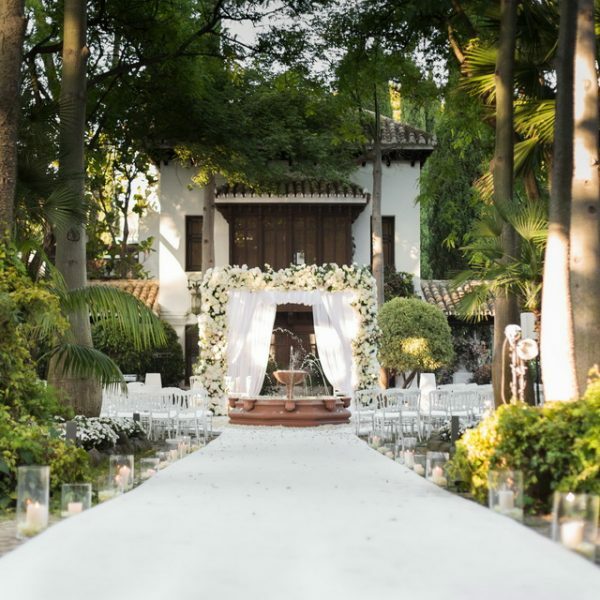 The gardens and fountains surrounded it, together with the delicate and personalized styling from Pedro Navarro who dyed the atmosphere of pink and purple colours made us fell the energy of the spring all around. Big sets of orchids and hydrangeas were flooding the ambience. The banquet area was decorated using a combination of mirrored tables for top table and VIP´s and tables with dusty pink table cloth. Also we had a combination of chairs to give a different look to the wedding: Louis XVI for mirrored tables and white Napoleón chairs for the rest of the tables. As the sun went down and the night came through candles where turn on all over the place. Also the ceiling of fairy lights made everyone feel cosy and overwhelmed. The cake, a five layer’s cake with a floral cascade, was a creation by Sweets things by fi. With the final hint from Pedro, who create a bed of flowers following the same line than the wedding decoration, gave it a special and exclusive touch. A special thank you to L&R for trusting us on this special occasion and as usual, thank you to all the suppliers and hotel staff that made this possible! Details picrtures captured by Dmitri Yanminchev and official pictures courtesy of TLH.